A kitchen remodel can improve both your quality of living in your home and your home’s value. Increasing your home’s value can benefit you when it’s time to sell and if you choose to refinance your home. You have many options and decisions to make as you explore a kitchen remodel. 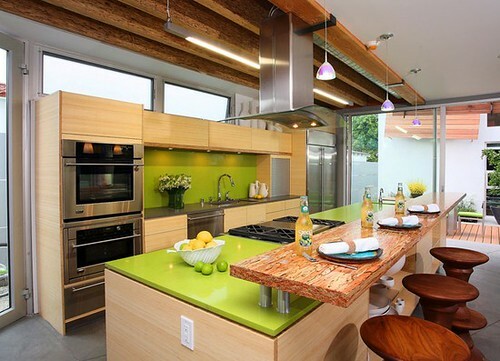 If you wish to pursue a green remodel of your kitchen, you can create a beautiful and useful kitchen work area while ensuring that your work does not negatively impact the environment. The best kitchen remodel investments will be the ones that create a kitchen space of your dreams while improving the value of your home. 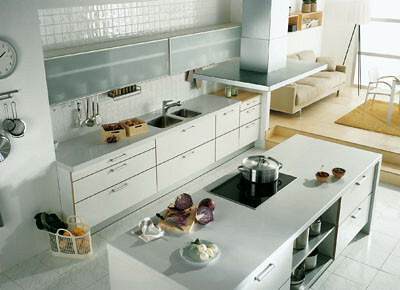 An island in the center of a busy kitchen can be both efficient and attractive. If you install an oven elsewhere in a wall, you could even place a cooktop surface on the island to provide a cooking zone with ample workspace and abundant storage below the surface. A warming drawer might even serve your needs effectively as you take food off the island cooktop. Don’t forget an exhaust system over the island so you won’t need a range hood over the island. When you’re upgrading your kitchen, a commercial-size range might be a splurge you plan. With a commercial range, you’ll have more BTU output, more burners, increased oven space and generally more power than a standard residential range. Instead of wood cabinet, lighten up your kitchen with glass doors on the cabinets. Glass cabinet doors give you the look of a built-in china hutch right in your kitchen. Add interior lights in the cabinets to create delicate spotlights to show off your favorite dishes and glassware. When you spring for built-in appliances, your kitchen receives an instant upgrade that gives it a professional, integrated appearance. The lines of your kitchen will appear smooth and efficient and the entire feel of the kitchen will change. When you spend time preparing food in the kitchen, you’ll collect various countertop appliances that need a convenient home. House these kitchen workhorses in a spot where you can access them easily, yet they don’t necessarily take up valuable countertop space. An appliance garage can sit at one end of the counter, right beside a work area where you’ll often use them. When not in use, you can stash them away conveniently. Efficiency is the name of the game in a well-designed kitchen. The three points of an effective triangle include the sink, stove and refrigerator. Generally, the most distance you should allow between these three points in your kitchen is 26 feet. Don’t worry about making each leg of the triangle equal – but do make sure that you don’t place any obstacles such as islands or cabinetry, between them. Consider making a fourth point — called a “landing area” – where you’ll work on food prep. With a little thought about design and efficiency, the best kitchen remodel will return significant return on your investment. Kathryn Hatter is a Redbeacon contributer and general contractor expert to several publications, including the “San Francisco Gate” and the “Houston Chronicle.” She is an accomplished gardener, seamstress, home-improvement guru, painter, cook, decorator and digital graphics creator.